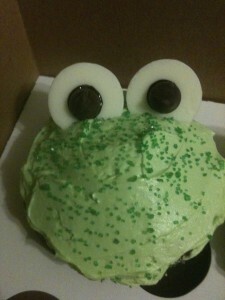 an adorable frog cupcake, in honor of leap day. don't worry. no frogs were harmed in the making of this treat! since no show and tell would be complete without a tutorial, here are step-by-step instructions on how to recreate these little guys at home. it’s an easy and fun way to bond with your kiddos – or just bring out the kid in you! 2. Add confectioners’ sugar and salt; beat at medium-low speed until most of the sugar is moistened, about 1 minute. Scrape down the bowl and beat at medium speed until mixture is fully incorporated, about 30 seconds. Scrape bowl, add vanilla and heavy cream, and beat at medium speed until incorporated, about 20 seconds, then increase speed to medium-high and beat until light and fluffy, about 4 minutes, scraping down bowl once or twice. *Don’t have a vanilla bean on hand? Omit the vanilla bean, and increase the amount of vanilla extract to 1½ teaspoons. 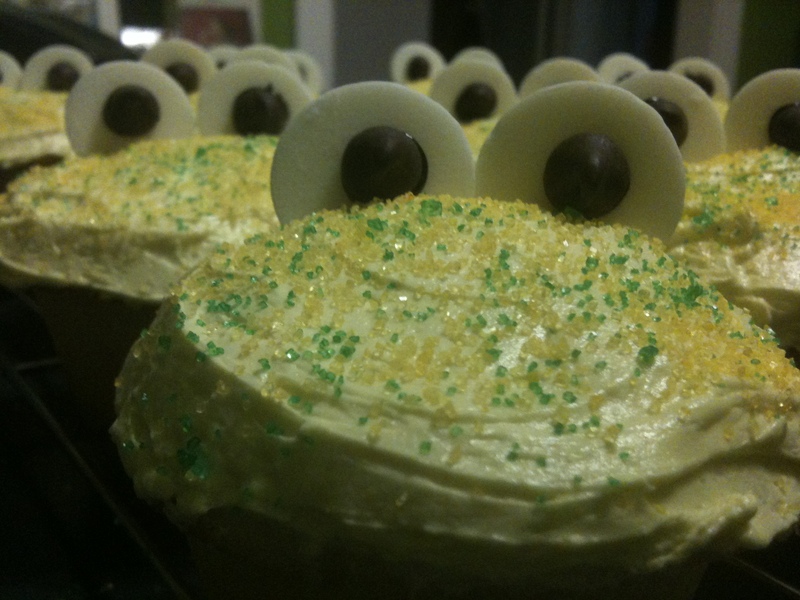 to make your icing a glorious froggy shade, add food coloring after the vanilla and heavy cream have been incorporated. i like these gel icing colors from Wilton. a little goes a long way. i buy the primary colors (red, yellow and blue), and combine them to create my own shades of greens, oranges, purples, etc. so the cupcakes are baked and cooling, and your easy buttercream is made, dyed and ready to be applied. now all you need to make are the eyes. to make froggy eyes, all you need are 1 bag of Wilton Candy Melts® and 1 bag of chocolate chips. line up the candy melts on your counter or table in sets of two. dab a small amount of your icing in the center of each candy melt, then affix a chocolate chip to the icing. by the time you are done frosting each cupcake, your froggy eyes will be dry and ready to be applied! and that’s as easy as sticking them into the frosting, side-by-side. i hope you enjoyed this easy tutorial. “hoppy” leap day everybody! This entry was posted in recipes by Jillian. Bookmark the permalink. The website is awesome…can’t wait to try all of the pastries!! Delicious and entertaining as well! !